Lots of people choose to burn their outdoor wood furnace through the summer. Here’s a few tips to help you out. Burning in the summer is different than burning through the winter because the heat requirement, or load, is so much smaller. The unit will idle and let the wood smolder for much longer. This idle time turns the wood into charcoal, which is good, but it will not always burn very hot, which is bad. Sometimes summer burning will lead to the high limit tripping. If this is happening it is probably time to either adjust the door or change the door seal. Even in the summertime your outdoor boiler shouldn’t be tripping the high limit switch. If it does happen it is usually because air is leaking into the firebox through the door seal. Burning small fires by loading less wood is strongly advised when burning through the summer. This will help avoid over heating the unit and also make cleaning easier. It is very important to keep the firebox clean when burning through the summer. A smaller load means that the blower runs less. Since the blower runs less the wood may not burn into light, fluffy ash as readily. Be sure the ash doesn’t pile up or stick to the firebox steel. Clean the firebox completely as specified in the owner’s manual, at least once per month. Also, be sure to keep the door cute clean. Creosote can be another potential problem in the summer. Because the load on the unit is less than in the winter time the firebox won’t always be heated long enough to burn the creosote off the walls. Creosote can be corrosive, and because it’s insulating, it will diminish the efficiency of your heat transfer. The best way to take care of this is to turn off the blower for 24 hours then turn it back on. By doing this the temperature in the water jacket will drop. After the 24 hour period is over and you turn the blower back on the fire will burn longer to bring the temperature back up. Doing this once per month or more will burn off excess creosote and keep your firebox cleaner and more efficient. Burning through the summer is a great way to supply hot water and save money. 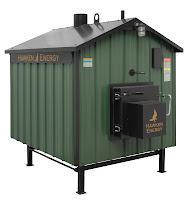 By following these simple steps you’ll enjoy your Hawken Energy outdoor furnace that much more. If you have any further questions about this topic or if you’d like to learn more about Hawken Energy feel free to contact us.